Over the last year or so Chef Jesse Furman and his team at Free Range LA have quietly been serving up Los Angeles’ best fried chicken sandwich. Now, I realize that’s a bold statement with competitors like Son of a Gun, Plan Check and ink.sack all peddling their own worthy versions of crispy, golden fowl on a bun, but trust that Free Range is sitting alone at the top. Those in the know (wait, you mean you don’t follow @jonbuscemi on Instagram for his tireless updates on all things Free Range LA?) show up religiously to the Melrose Place Farmer’s market every Sunday from 10am-2pm for Chef Furman’s locally sourced, egg and chicken-centric menu items. Craving breakfast? Their bacon, egg, and cheddar biscuit will cure the meanest of hangovers in an instant. Feeling more like lunch? Then the fried chicken sandwich, or one-off specials like the Bacon Cheddar BBQ deluxe, will leave both your stomach and soul feeling holy. 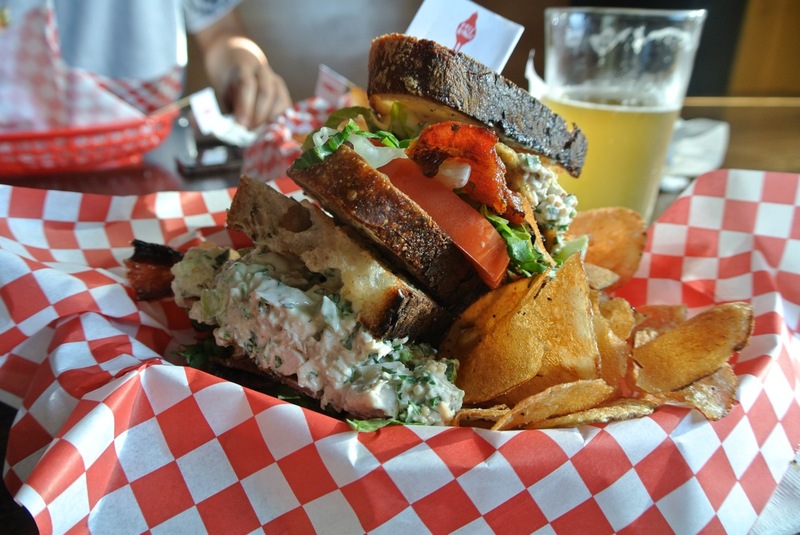 There were only two menu options: the tried and true fried chicken sandwich, and the official debut of the ultimate club on fresh baked Rye bread courtesy of Clark Street Bread. 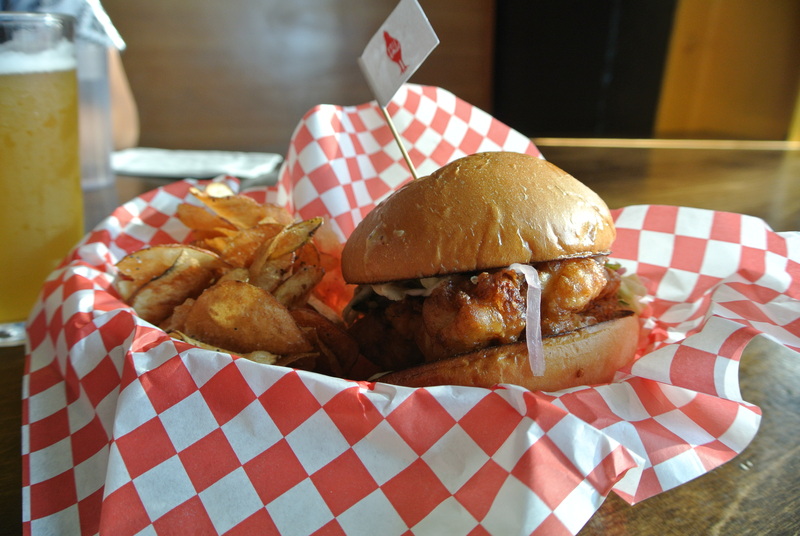 The fried chicken sandwich was its usual glorious self, a soft grilled bun providing the support for the irresistibly crunchy, yet moist tempura battered chicken thigh topped with housemade slaw, pickled red onion, and a honey mustard aioli. Admittedly the slaw seemed to be lacking the kick from the usually included jalapeno, but nonetheless the sandwich proved worthy of the hype. The other choice for the evening was the ultimate club, a sandwich I had only seen glimpses of in various stages via Instagram in the weeks leading up to the pop-up. Let’s start with the bread, an incredible Rye baked fresh by the good people at Clark Street Bread, that was everything you could ask for: soft and chewy on the inside with a great outer crust, and left on the griddle just long enough to warm it up. Between the two thick slices was a heaping scoop of roasted chicken salad set off by the addition of pickled mustard seed, with slices of ripe tomato, crisp shredded lettuce, and candied bacon to finish it off. The night was truly a coming out party for the entire Free Range team, an introduction for the newly initiated and a celebration for those who’ve been hip to the game for some time now. 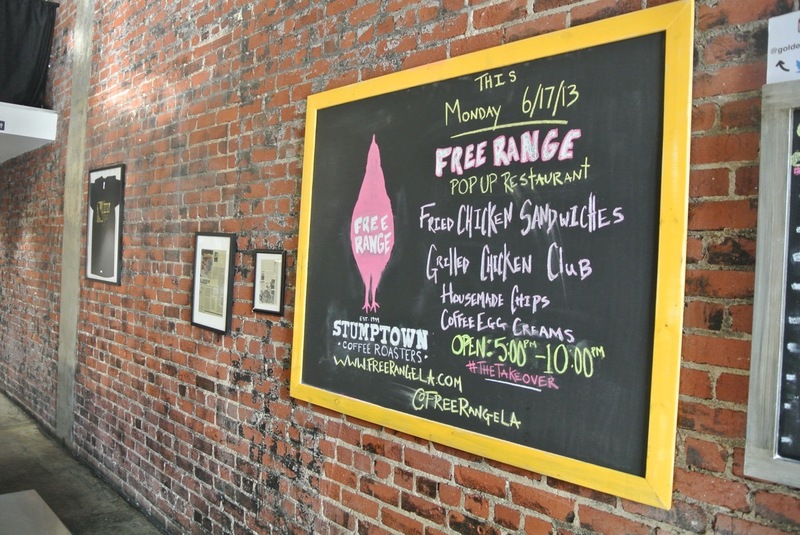 The most exciting part is that this is just the beginning for Free Range LA, mastering one sandwich at a time as they continue to bridge the gap between accessible comfort food and high-end ingredients and techniques.